Buy a new camera and lens? Sign up for a 2 hour introduction to camera settings and technique workshop. In this workshop we will go over the basic functions of your new camera and lens. You will gain knowledge of your new gear which will help you prepare yourself for better images. We will go through all the settings and how they work. This workshop is intended for the beginner photographer learning about wildlife photography. We will go over photographing wildlife ethically, working different angles to get the best image as possible, Using the light to your advantage, Best camera settings for the situation we will be in. Sign up for this 1 hour tutorial in post processing your images in Lightroom and Photoshop. In this 1 hour class we will discuss the basics of photo editing your images from a RAW format to a finished Jpeg format ready for printing. Online Skype tutorial is also available. ​​​​​​​​​​​​​​​​​​​​​​​​​​​​​​​​​​​​​​​​​​​​​​​​​ What should I bring ? Patterns, Sunny for a couple hours then quickly switches to clouds and rain. Being properly prepared for the unpredictable elements the winter season can bring will ensure you a successful photography tour. The terrain we will be walking on will be hard packed gravel paths, Grassy, muddy areas, uneven terrain, at times minimal tripping hazards. • Any other items you want to bring to make yourself comfortable through the tour. ​​​​I just wanted to send you a huge thank you again for hosting such an awesome tour last Saturday. It was a real treat to meet you and to get a glimpse into your life as a wildlife photographer. I would like to offer you this letter of recommendation as I truelly believe the work you are doing is valuable both to the photography community and to the incredible wildlife you document with such care and reverance. As someone who has recently begun to focus on photography and wildlife conservation, I find it invaluable to have photographers like Anthony around who are willing to guide and mentor others in a responsible and ethical manner. From the moment we started the tour it became clear that the primary focus was the well being of the animals and that a great deal of time and effort had been put into making our trip an unforgettable experience. Although there is never a guarantee that you will have encounters with wildlife, Anthony's years of experience and countless hours in the field ensured we had our first encounter within minutes of arriving at our first location. Anthony has a deep understanding of the behaviours of the animals we were observing and he was always willing to share and answer any questions we had. He also happens to be a very skilled photographer and was gracious and open to sharing his techniques for capturing images in sometimes very challenging lighting situations. By the end of the day we had seen 3 of the 4 species we had planned on. This speaks volumes to the care, effort and expertise you will have access to when joining one of Anthony's tours. I came away from the day with a deeper understanding of animal behaviour, the time and dedication it takes to track and observe these wild and elusive animals and if that wasn't enough, I also left with a better understanding of my camera. I'm looking forward to applying the skills and techniques I gained from the tour to my own wildlife journey. I can't thank Anthony enough for setting such a great example for myself and others to follow. I highly recommend one of Anthony's tours if you are interested in a unique wildlife viewing and photography experience. The recent "Winter Birds of Prey Photo Tour" Anthony offered was a wonderful experience and we got to photograph many birds of prey (Red-tailed Hawks, Bald Eagles and Barred Owls, as well as seeing a few American Kestrels). But what impressed me most about the tour was Anthony's knowledge of both photography and birds, which he shared most generously with us. But what really pleased me was his approach to photography. 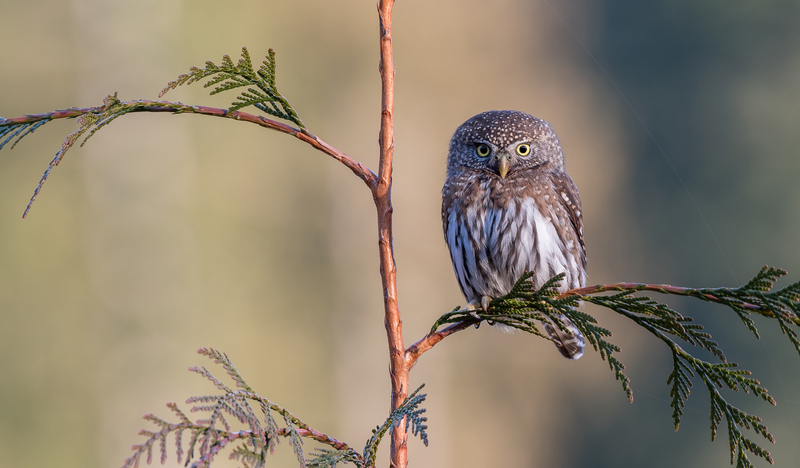 Anthony is all about "the long game" and ethical behaviour: How can you best photograph birds? By knowing where to find them, understanding their habits, being patient and, above all, respecting their "personal space." 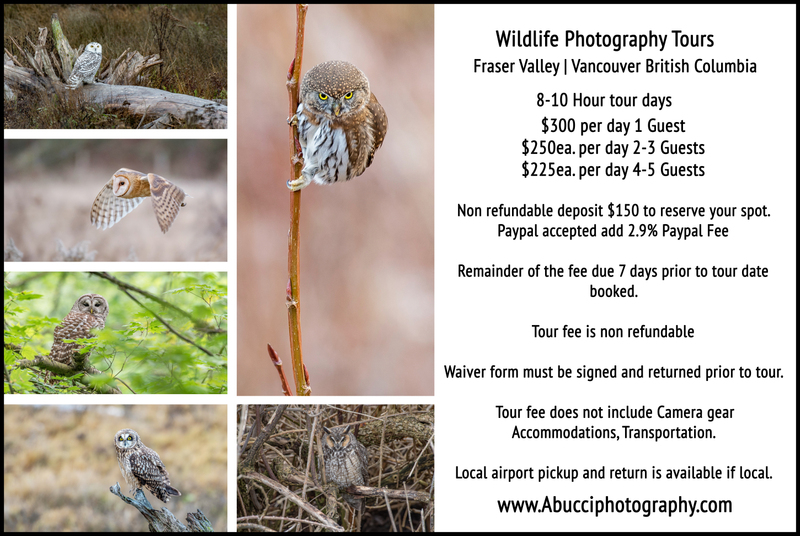 So long as you have realistic expectations about wildlife photo safaris (and the weather in the Lower Mainland! ), you will not be disappointed.